La Gastronomie Pizza is Madagascar's first ever pizza joint. Now it is also the country's largest fast food outlet. Owner Chef Mbinina worked hard to build his brand in a country where there are no fast food brands. Mbina began his interest in food while still in high school. He worked as a dishwasher on weekends and learned how to cook by watching the food channel. He soon realized that pizza was an easy food to make. His family helped out when he first started. In the beginning, he only had 5 different pizzas on the menu. Now his menu includes 10 different pizzas, plus ice cream. 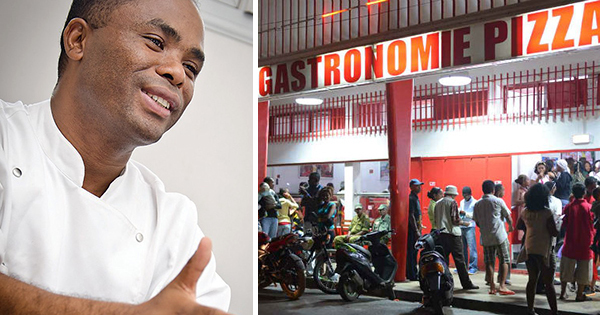 He has expanded his business to 27 outlets, and 700 employees across Madagascar. On weekends, his restaurants can serve up to 50,000 customers. The menu at La Gastronomie Pizza has also expanded to include hamburgers, french fries, and chicken kebab sandwiches. A Turkish chef came to the restaurant from Turkey to train employees on how to make the kebab sandwiches. Now, La Gastronomie is the most recognized brand of pizza in Madagascar. Although there is some competition now, they still have the strongest brand. Mbina says his ultimate goal is to expand across Africa. Madagascar is a huge island nation off the southeast coast of Africa with a population of more than 22 million. It's home to thousands of animal species, such as lemurs, found nowhere else, plus rainforests, beaches and reefs. The official languages of Madagascar are Malagasy and French.